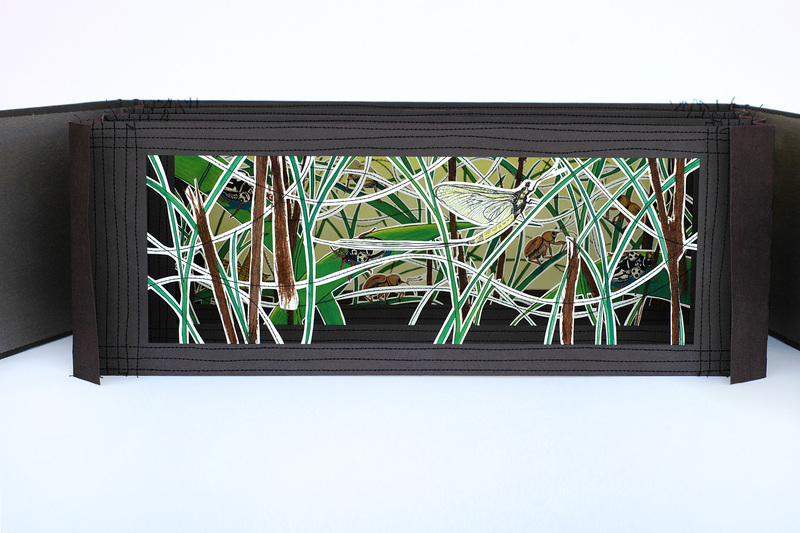 The hand painted critters showing Mayfly, Anchor Bug, Weevil and Grasshopper. Pieces of thin layers of driftwood are sewn to the paper, machine stitching is used as a design element and to add stability to the structure, panels are cut out by hand. 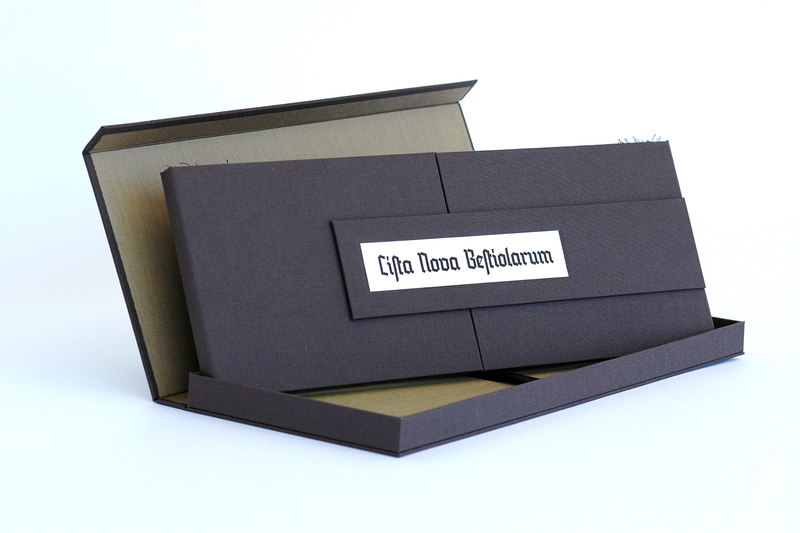 This project emerged out of a series of tunnel books where my images were rubber-stamped pictures. I wanted to work in a larger scale and use hand-drawn images to create a unique piece of art. 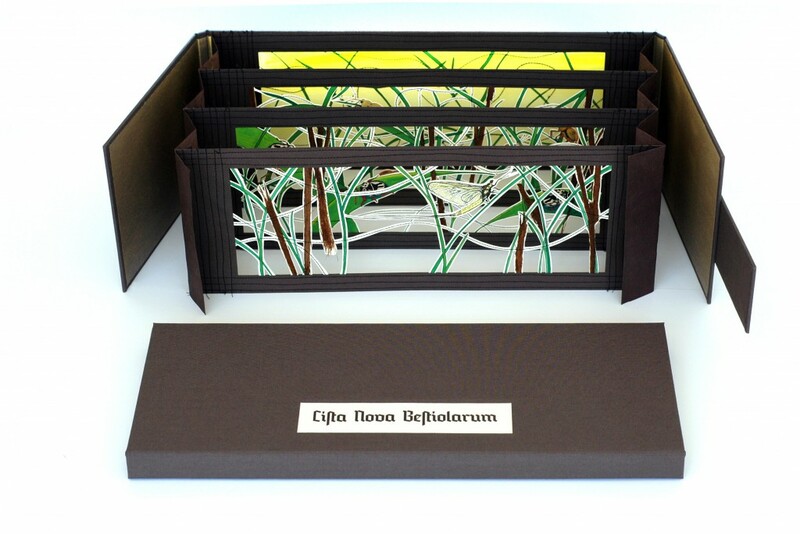 The structure of the book works exceptionally well to showcase a piece of nature featuring grass and insects. It takes the viewer to a warm summer day. Imagine a hike in nature, taking a break and sitting or lying down along the trail. Taking in the smell, sound and warmth of the surroundings, and in this stillness becoming aware of the small critters buzzing in the air between the blades of grass. What a miraculous world! Sitting in stillness and observing the beauty of creation in this micro cosmos is breathtaking. What a gift to be able to slow down and witness this moment. This book is the first of its kind, finished in May 2011. Every copy will be unique in an open edition.